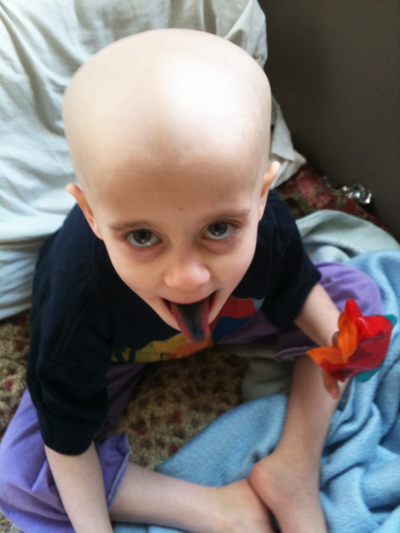 Elle's latest round of chemo just finished and, unfortunately, the tumor hasn't stopped growing. On the upside, the rate of growth was slowed. And, most importantly, it is still just the single tumor. Even more importantly, Elle is still full of energy and positive attitude. So there are a few things that could happen now. We could try more chemo. We could go ahead with radiation therapy. There are some Phase 1 trials at Dana Farber that could be investigated. And there is discussion of a possibly biopsy. Apparently, in extremely rare cases, the type of cancer can change. So there are still a lot of options and choices on the table. It's another disappointment, but actually better than the last couple of times. But in the end we will beat this thing. Elle simply won't allow any other outcome. Here she is, showing off a very blue tongue after eating a very blue Fruit Rollup. Dave, thanks for keeping us updated. I wish you were getting better news, but it's so great to hear that Miss E is still in good spirits. We hope to see her (and everyone else) soon. God bless her, she's the cutest thing alive!